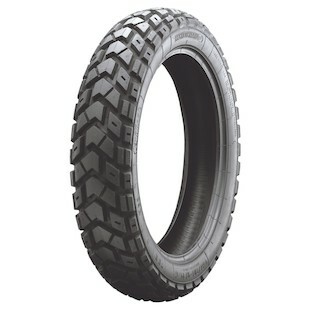 Brand new to RevZilla.com, the Heidenau K60 Scout Tires have quickly ascended the ranks as one of our most popular 50/50 on and off-road tires. Riders so far have a great experience with the Heidenau K60 Scout, finding them to provide excellent longevity coupled with good grip particularly on the shoulders. The large grooves in the chevron-style tread pattern also enable dirt to be quickly expelled when riding these tires off-road. Heidenau has been in the rubber and tire business for decades, and the Heidenau K60 Scout Rear Tires and front tires are truly a pinnacle achievement for their brand. Thus far, we've heard nothing but positive feedback from ADV riders using the Heidenau K60 Scout Tires. Other than the very specific rubber compound used by Heidenau, there are some other key features to the K60 Scouts that set them apart. First, different tire sizes in the rear use different tread designs. Heidenau K60 Scout Rear Tires for larger, higher torque bikes have a larger reinforced block pattern which ensures that they remain firmly planted on the road. However, the tread spacing and depth is enough to bite in the dirt and force chunks aside. This isn't necessary for smaller bikes, so Heidenau maintains a smaller reinforced block. By varying these specs based on the bike's application, Heideanu is able to deliver the best possible compromise between on-road and off-road performance for a motorcycle tire. We look forward to logging a ton of miles on these tires this year. Stay tuned for our opinion review to come. For the 90/10 tire from Heidenau, check out the Heidenau K76 Rear Tire.